Two-Sentence Summary Mindy discovers that Danny’s mother is a shoplifter, but Annette tries to deny those allegations when Mindy confronts her. Meanwhile, Peter discovers that Abby may be his perfect woman, but his definition of the perfect woman may need some changing. Danny: You look a lot like Mindy in that outfit. Peter: Keep your eyes up here, man! My Thoughts This season, The Mindy Project has finally seemed to achieve a good balance between highlighting their guest stars while not making their appearances feel like blatant stunt casting moves. “We Need to Talk About Annette” was as entertaining as it was because of the two very funny women making recurring guest appearances (Rhea Perlman and Allison Tolman), and they were used just enough to be memorable once again while still letting the actors and character arcs around them shine, too. I said it last week, and I’ll say it again: I didn’t watch Fargo, so I had no idea who Allison Tolman was before this little arc. And now I am more than a little bit in love with her, and I don’t want to see her arc end. For only being in two episodes, there was a lot of nice nuances to her character; I liked that we were introduced to her as a woman who was confident and successful, but that doesn’t have to always mean a person is responsible. Maybe I’ve just been thinking about Gone Girl too much lately, but Abby’s characterization was a really nice depiction of the problems inherent in the “cool girl.” Peter may have thought for a long time that he liked women who didn’t challenge him, and it’s clear that Lauren choosing Jeremy still hurts and is making him wonder if challenging women will ever want him. However, it was nice to see him start to realize that—even if Lauren hurt him—he needs to find someone like her, someone who makes him want to be a better person. This season of The Mindy Project has done a great job of showing the ways that love can help you grow as a person without someone actively trying to change you. And I was so happy to see that theme become a part of Peter’s story, too. The best relationships are ones like Mindy and Danny’s—ones that challenge people to be more than they could be without the inspiration and support of the other person. It was a huge point of character growth for Peter to discover that he wants that, and it was sweet to see that delivering the baby and watching the happy parents was part of what triggered his desire to want something more than the one-dimensional relationship he could have with Abby. These past few episodes have been very strong ones for Peter, and I like that the show seems to be zeroing in on the idea of Adam Pally as the emotional anchor of the supporting cast. He’s done a great job with all of this character growth so far, and I’m excited to see where all of it leads. Mindy and Danny’s story in this episode led once again to some nice growth—especially for Mindy—even if I found the message of “Family is more important than the law” a little bit of a test of my suspension of disbelief. (That’s also just the chronic rule-follower/authority-respecter in me talking.) I’ve enjoyed seeing these interactions with Annette help Mindy examine her own flaws and work to be better. 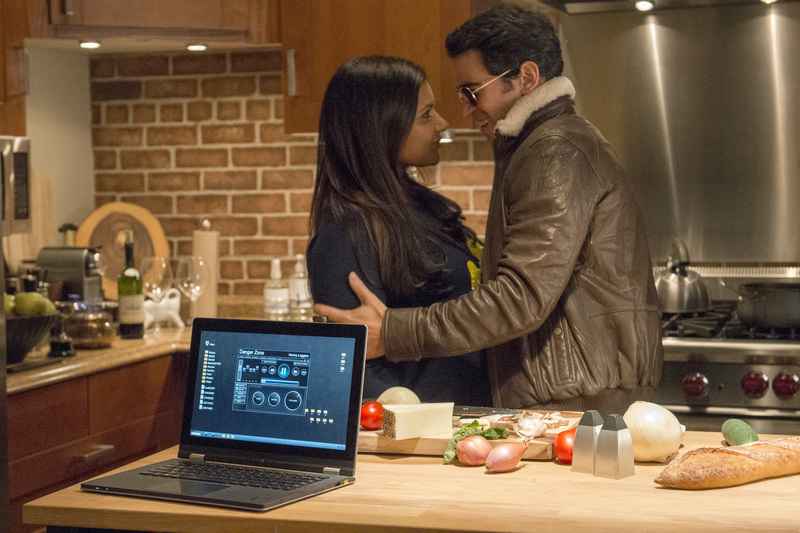 In this case, the episode started with Mindy explaining to Danny that she downloads everything illegally (leading to a great moment of comedy when they threw the virus-addled laptop off the bed). And in the end, she actually bought music legally. It was a small moment of growth, but it was nice to see the events of the episode have a little bit of an impact. For as much fun as Perlman and Kaling (and Perlman and Messina) are together, there’s still nothing that can compete with Kaling and Messina simply being allowed to show Mindy and Danny having fun together. That last scene, with all of the great Top Gun references, felt so perfectly realistic. Real couples have those moments where they can be silly and make each other laugh, and I love when Mindy and Danny get to have those moments. Playfulness is such an important part of a good, healthy relationship, and it never fails to make me smile to see Mindy and Danny in that light. I thought it was a good, funny episode too. Another point of difference between Danny and Mindy worked through – and one that a lot of people can relate to. The idea that downloads are illegal just doesn’t mean anything to some people, but is blatant theft to others. I liked that they didn’t make that the focus of the episode though. I didn’t see the shoplifting coming, but it made sense. How do you tell someone their poor old mom is a thief? More Annette is always good. And Dot. And Catholic guilt. Anyway, good fun episode. Not much to say really… it was just good. I totally agree with you, Jo; it was simply a good episode (which made my writing life easier since I had so much other stuff to analyze with both OUAT and Castle this week!). I also would have liked to have seen more of Abby before this storyline took the turn it did, but I’m willing to see how this all plays out with Peter since I’m enjoying the direction they’re going with his character right now. I really enjoyed this episode! I love that Mindy has clearly been incorporated into Danny’s family life because that’s such an important part of his characterization. Plus, she and Annette are incredibly fun to watch together. I’m so excited for what they’re doing with Peter. I would have liked Allison Tolman to stick around for longer because she’s great, but I just feel so proud that Peter is starting to grow up. I want him to grow and be challenged by things. He has so much more potential than “dumb frat boy who never grew up” and I can’t wait to see more. We’ve been lacking in good Peter and Mindy conversations lately too so I want to see them talk about a new girlfriend or for Mindy to give him ridiculous dating advice at some point. I’ve been missing Peter and Mindy’s scenes together, too! I liked seeing Mindy interact with both Peter and Abby this week, but I can’t wait for another good scene with just the two of them because Adam Pally and Mindy Kaling are so great together.